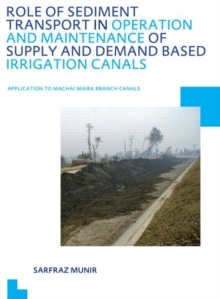 This work describes the role of sediment transport in the operation and maintenance of demand-based downstream controlled irrigation canals. Sediment deposition in these irrigation canals severely affects the operation of the automatic flow control system. The book also discusses sediment transport modelling in irrigation canals. A simplified 1-D mathematical model SETRIC (SEdiment TRansport in Irrigation Canals) has been improved with the inclusion of downstream control component for the downstream controlled irrigation canals. Based on field measurements and sediment transport modelling, a number of approaches have been proposed for sediment management in such irrigation canals by improvement in their design and operation. This book will be of interest to Irrigation Engineers and Managers, Hydraulic Engineers, Water Resources Engineers and Managers, Civil Engineers, and Agricultural Engineers.